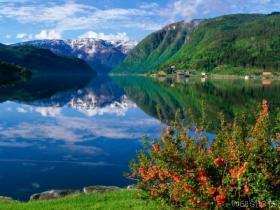 As I write this Norway is in my brain duking it out with Laosas the country I've likes most so far. It's not surprising that I haven't seen many overweight Norwegaiuns, the country is so beautiful you just have to explore it. Every train ride is magic, rolling through green farmlands, pristine lakes and alpine wilderness. I've visited Halden, one of the top locations in the world I'm told. For the orienteering community, thats where BJ lives now (he's just the same, thank god). We went for a run in the forest. It was like a movie set, with little ponds, pine trees and little wildflower clearings everywhere, I felt bad running on it! Tricky as well, like Pittwater with rocks, marsh and lower visibility. The East is all about the fjords. Just spectacular, the photos do not do the place justice. We climbed Preikestolen (Pulpit Rock) which was heaps fun. Four ks twisting through the forest and you come out on this massive slab of rock that looks 650m straight down to the water. Waterfall enthusiasts would love the region too, with all manner of thundering cascades, twisting little snakes and frozen trickles at every turn during a fjord cruise. Another cool things about being so far north is the 20 hours of sunlighy a day. You'll be sitting ioutside wandering around and feel a bit tired - then you'll realise its 11 o clock! It was funny leaving a world cup match last Saturday at 11:30 and there were all the people around in their going out clothes in broad daylight. Oh yeah, and the clice about Scandinavians being the best looking in the world seems to hold true. You can't help sometimes walking down the street feeling like a hobit amongst a group of models.Not anorexic supermodels, but healthy, zest for life types. OK thats it for Norway - on to Sweden.